This section offers you quick access to fire safety publications that are prepared by Tasmania Fire Service and other organisations. Please select and right-click on a document link to download the PDF file to your desktop. Alternatively click on the "Order Free Hardcopies" link to order free printed copies of the required publication from your local Tasmania Fire Service Office. Home Fire Safety (PDF 1.7MB) - General home fire safety advice. Visual Guide to Homes Fire Safety (PDF 4MB) - General home fire safety advice for Migrants. Home Fire Escape Plan (PDF 2.2MB) - Assistance to design a home fire escape plan for your home. Juvenile Firelighter Intervention Program (JFLIP) (PDF 862KB) - Overview of the program. After the fire (PDF 2.1MB) - Advice to clients about what to do in the hours after a fire strikes. Bushfire Survival Plan (PDF 5.4MB) - An essential guide to preparing yourself and property. Leave Early Checklist (PDF 81KB) - Checklist only. Stay and Defend Checklist (PDF 81KB) - Checklist only. Emergency Kits Fact Sheet (PDF 2MB) - Essential guide to preparing a survival, relocation and recovery emergency kit. Prepare for Bushfire A3 Poster - A3 Bushfire Safety Poster. Prepare for Bushfire A4 Poster - A4 Bushfire Safety Poster. Don’t Risk Your Life A3 Poster - A3 Bushfire Safety Poster. Don’t Risk Your Life A4 Poster - A4 Bushfire Safety Poster. Campfire Safety A3 Poster - A3 Bushfire Safety Poster. Campfire Safety A4 Poster - A4 Bushfire Safety Poster. 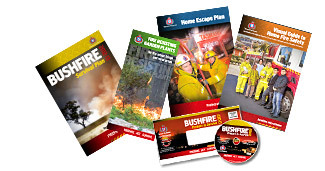 Bushfire Prepare to Survive DVD - An essential guide to preparing yourself and property. Using Fire Outdoors (PDF 1.8MB) - A guide to using fire safety outdoors, at home and in the bush. Farming Communities and the TFS (PDF 1.7MB) - Farming communities and TFS working together to reduce bushfire risk. Reducing Harvester Fire Risk (PDF 3.9MB) - A Back Pocket Guide from the Grains Research and Development Corporation. Fire Resisting Garden Plants (PDF 1.3MB) - Reduce the fire hazard in your garden. Advice to householders when a bushfire threatens (PDF 48KB). Guide to Community Protection Plans (PDF 1MB). - Bushfire plans for your community. Community Protection Plans - Bushfire survival advice specifically for you. Bushfire-Ready Schools - Bushfire-Ready Schools explained. Managing fuel for safer communities (PDF 780KB) - TFS Fuel Reduction Unit - fighting fire with fire. Planned Burning for Farmers and Landholders (PDF 1MB) - endorsed by the State Fire Management Council. State Bushfire Safety Policy (PDF 360KB) - endorsed by the State Emergency Management Committee. State Fire Protection Plan (PDF 973KB) - approved by the State Fire Commission on 31 May 2013. Use of water additives in controlling bushfires (PDF 665KB).